A Change is Comin’. 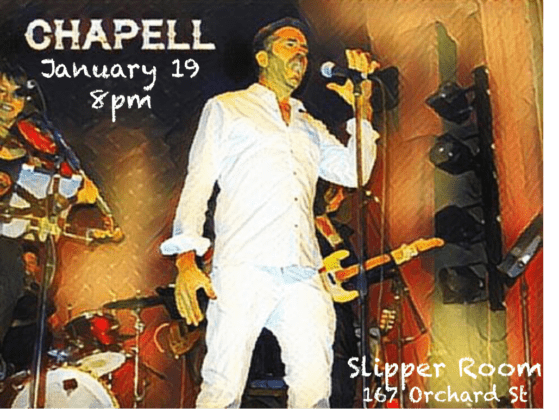 BMG / Fieldhouse Music artist Chapell will be taking the full band to NYC’s Slipper Room for a special Show on the eve of “the inauguration” on Thursday, January 19 at 8pm. (Doors at 7pm) The Slipper Room is at 167 Orchard Street. Chapell plays indie music for adults. Over the years, Chapell has collaborated with core members of iconic bands like Talking Heads, the Tubes and Chicago although his sounds is unique: Imagine Jonathan Richman fronting Wilco. Chapell’s unique storytelling and gallows humor is a perfect fit for Slipper Room. If you haven’t gone to see Chapell before, this will be your last chance before the great TRUMP experiment begins. Will live music be outlawed on January 20? Will Chapell be appointed to run the ministry of cultural affairs? Stay tuned – because nobody, and we mean NOBODY knows what will happen next.